Windows 8 tablets have been getting smaller and cheaper as time goes by, with some 8" models now selling for under $200. But earlier this week at Computex in Taiwan Toshiba showed that it might be possible to go even cheaper. 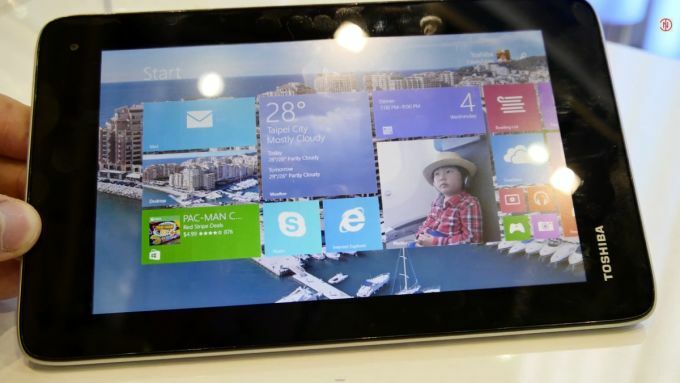 Toshiba showed off a new 7" Encore tablet which runs Windows 8.1 on a quad-core Atom CPU. There's no solid info from Toshiba on price or release date, but the price that is being bandied about by bloggers is that this tablet could cost under $150. The tablet has a 1.33 GHz Intel Atom Z3735 quad-core CPU, with 1GB of RAM and 16GB of storage. It has only a single front-facing camera (this is part of the reason why the price is so low), and the screen resolution is reportedly 1024 x 600, so this tablet is not going to be for everyone. But it does represent a new lower rung for Windows 8 tablets, bringing them closer to competing directly with $99 Android tablets. In fact, this tablet reminds me of a couple $99 and $110 tablets I have seen over the past few months, leading me to wonder why it costs more. Microsoft is waving Windows license fees for budget devices, so this tablet should be nearly as cheap as an Android tablet that has similar specs. Perhaps Toshiba is pricing it higher because they, as a major device maker, have more overhead than budget tablet makers? I don't know, but in any case here’s a hands-on with the device from nDevil TV, which pegs the price at $149. As long as it has a microSD slot it is viable as a reading device. Being able to load Calibre on-board ensures it. But the Dell at $199 is still a bit better. Toshiba products get discounted so, like HP, I expect the street price to be lower. Say, $129. I agree with fjtorres about the Dell. I picked up the Dell Venue 8 Pro for around $200, and it’s been really nice. The biggest selling point is that everything works on it because almost everything is available in Windows (even silly things like Hulu and the web/device licensing). Battery life is great, the screen is nice enough, and it’s super responsive. The only two problems I’ve had are that the auto-brightness sets the screen too dim (relatively simple to fix), and it occasionally is dead when I go to pick it up after a couple days of non-use. Usually it’s okay, but it appears there is something about the WiFi sleeping that isn’t quite perfected yet. I think I’d prefer one of the rumored Samsung AMOLED displays for reading, but there’s always a tradeoff. From Where you bought Dell venue 8 pro ($200) ?? ?